I’m reaching out both for help and as a warning to others. 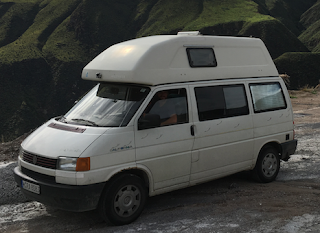 Some of you may have seen my post about my 1994 Westfalia camper van for sale in Cuenca several months ago. Well, as my (bad) luck would have it, I had some great buyers who spooked at the last minute when the muffler fell off. Since I had just paid more than $1500 in repairs, I was a bit startled myself. I called the mechanic who said he didn’t understand. He’d get it back in shape. The difficult part is that I had to be in the States, so was to send him money to store it (after yet another repair) while we found the next buyer. Long story short, my van was stolen and likely has been for sale by another person without any clear title. And for anyone who might be driving this van, please know it is a stolen van. A lawyer had little luck tracking the mechanic down. So, I’m asking for others to keep their eyes open. I’d love some insight as to how I might recover this vehicle or if anyone has seen it out and about town. The mechanic, handler and man who stole my vehicle (and surely has tried to sell it for himself) is: Daniel Ordosgoitte realtor.c21ve@gmail.com +593 096 792 8968. He has not returned an email or call since I had to leave the country. I desperately want my van back. Can anyone help on this? Zelie Pollon: +1 505 699 1662. Call after: 9 AM.